"No, this is Patrick's unsolicited opinion." PUBG and Fortnite Battle Royale are playing tug-of-war for each others' player base. At least one Australian PUBG player will not be swayed. In fact, they've announced their preference for PUBG with the aid of spraypaint and a wall. Twice. The artist, "lushsux," tagged a wall in Melbourne with the words "PUBG IS BETTER THAN FORTNITE." Another "PUBG IS BETTER THAN FORTNITE" was spotted, though this one is enclosed by a word bubble coming from the mouth of Savage Patrick (SpongeBob characters never stray far from the meme circuit). 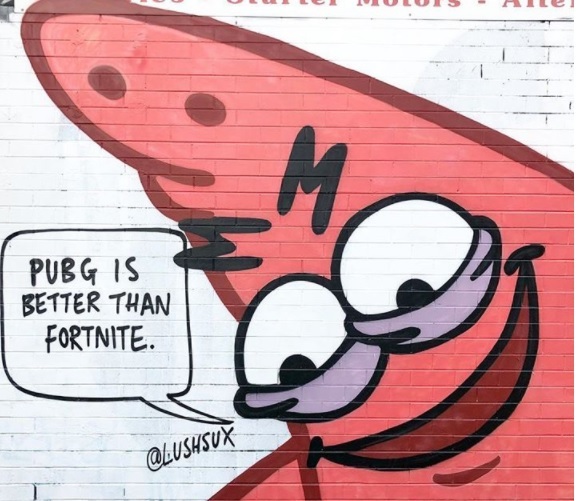 Maybe lushsux really prefers PUBG over Fortnite. Maybe they're just being provocative, since most of their work seems to involve putting memes up on walls. Their Instagram description for one picture says, "Can you imagine being 11 walking down the street playing Fortnite on your phone only to see this on a wall?" It stands to reason the stunt is meant to poke fun at passionate fans in general. Man, alien archeologists are going to wonder super-hard about us when they uncover our ruins 100,000 years in the future. Anyway, it's not a bad time to be a PUBG fan. PUBG Corp has a decent roadmap planned for the game, though Fortnite is never far behind with new content. Fight, fight, fight! If you're currently trying to complete the weekly challenge, you might want to look at our Fortnite Ice Cream Truck Locations guide. Tagged with Battle Royale,	Epic Games,	News,	PlayerUnknown's Battlegrounds (PUBG),	PUBG Corp..